Hi all! New to CC3+ but in absolute love with it!!!!!!!!!!!!! Been playing DnD since my parents bought me the first box set in the late 70s when I was 9, and recently was drafted to be a DM by a bunch of 20-something friends of mine and thanks to CC3+ used with MapTool they're pirates and smugglers wreaking havoc on a Mediterranean-meets-Polynesian world filled with the menacing powers of good (?!?) to fight against. There's a Brit-style paladin run land, interspersed Maori style settlements, and an Arabic kingdom all trying to trade with each other through a huge maze of islands, reefs, headhunters, monsters, etc. A proverbial gauntlet of nasty. The overland map darn near crashed my computer lol! Anyway, one of the good allied powers is an undersea city of aquatic elves. They're going to hold a key to what the pirate gang needs to find the ultimate treasure. I know they're going to have to go down there at one point. While perusing the symbols that come loaded into the default CC3/CD3/DD3 package...and KUDOS to Mike Schley cuz his artwork alone made me drop $100 on the software at first sight!! !...I noticed there were no undersea symbols like coral, shells, fish, etc. I also dug into the forum here and while there was a dedicated thread from a while ago and some isolated discussion, I wasn't able to find anything concrete. Does anyone know where I can find/buy a collection of underwater 'ambiance' symbols? I've got photoshop/illustrator and if you out a gun to my head I could do it but I'm SERIOUSLY time limited with work. I want to keep dazzling my party with 40 years of DM slight of hand and trickery but because I've integrated CC3/MapTool so much at this point, and it's so AMAZING to use, I want to keep going and not disappoint! Any ideas? #apirateslifeforme #sailwiththedaggertide! THANK YOU ALL, I LOVE CC3!!!!!!!!!!!!!!!!!! I have thought for a long itme about making underwater symbols, and now that we have the makings of a community art collection of some kind (not yet available) I can see myself making such things. The only thing is - what kind of style are you thinking about? My own style is highly variable tending towards realism. But that won't do you any good at all if you want everything 'Mike Schley'. I just can't seem to do that one! LOL! I am currently making stalagmites for the community collection. There will also be stacks of rocks and such like, and of course the matching rock fills. I have an idea I've always wanted to try but never had time to do - for the appearance of being underwater. I've always fancied that if you draw a HUGE circle of ocean fill that goes far off the map, then apply an inverted Edge Fade Inner effect to it so that the centre is transparent and the edge full opacity, you should get a nice naturally round window of view through to the underwater scene. Turning things generally blue might be achieved by adding a sheet underneath that layer which is covered entirely by a solid blue rectangle with a Blend Mode effect on that sheet set to Overlay and possibly with reduced opacity. Everything else would be underneath that sheet. Alternatively, use a transparent effect on a sheet for the sea placed below (in sheet order) all the underwater symbols. The Dundjinni archives (see the sticky above as to how to acquire them - they are free, along with CSUAC, Bogies and Vintyri - all very worth while) has some good underwater symbols in the Aquatic animals section. There may also be shells and other underwater objects available in some of the Annuals... or in the CSUAC/Dundjinni collections linked in the community resources sticky thread at the top of the forum. I just don't know because I haven't got many of the annuals yet and I don't use the CSUAC/Dundjinni collections, but I do remember Lorelei making a marvellous underwater map, and she uses a lot of their work. You could, I suppose, for smaller scale regional maps, use some of the overland city symbols and just drown them? I've also got a few of these knocking around if you want something clearer to use as a cover for a city built underwater. Just plonk it right on top of the city. 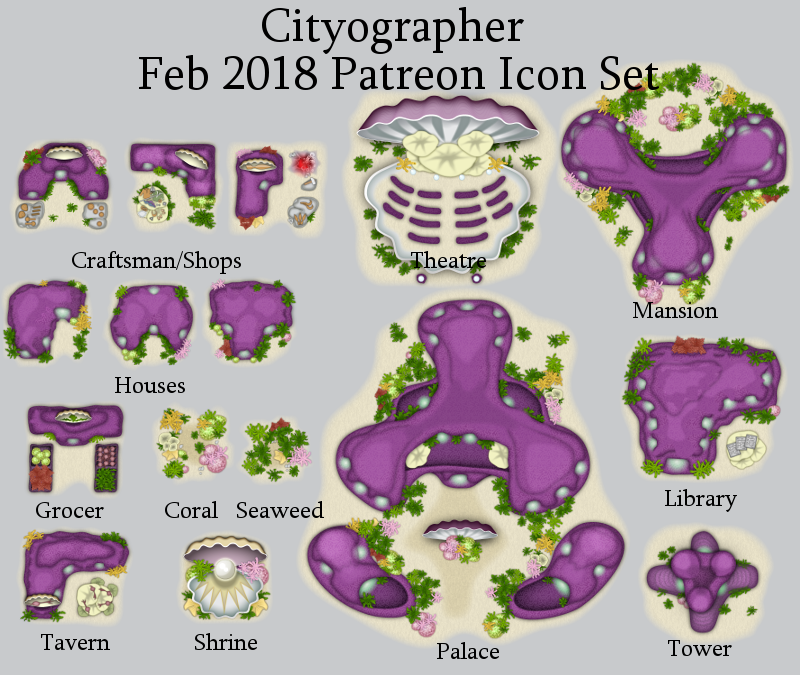 Inkwell Ideas just did some mermaid city stuff on the Patreon. I've been interested and hoping for undersea symbol sets for some time.